This post contains affiliate links for products that I use and endorse. This recipe will show you how to make a super easy Sweet Potato and Peanut Soup with simple ingredients, easy steps, and enough to pack for leftovers or stash away in the freezer! 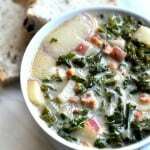 This is a great meal to make when temps start to dip and you need a big bowl of soup and some time to stay in and be cozy! Friends, we’re preparing for some serious hunkering down in Minnesota. I feel like it’s been such a mild winter and now we are facing three days of school closure here this week because of snow and severely cold weather (Hello, -45 wind chill!). Yikes. Sometimes hunkering down sounds so dreamy. But my Hygee dreams get dashed when my kids start scream fighting or make announcements like “Let’s have a spinning contest!” We just completed school closure day one and I’m plotting how we can get some energy out and not leave the house. 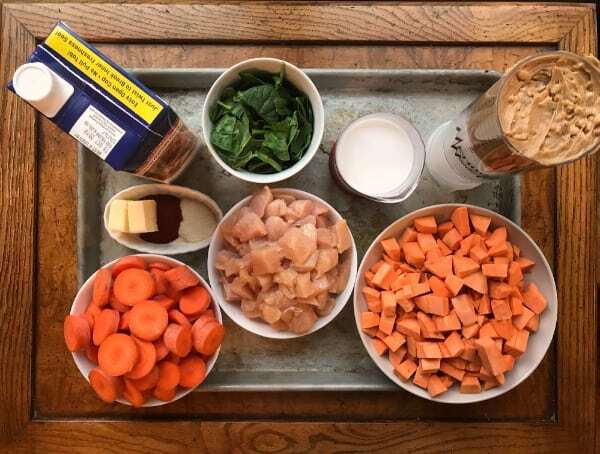 If you are hunkered down and you’re finding yourself needing some comfort food amid the chaos of winter and in between mediating sibling fights, try this Sweet Potato and Peanut Soup. 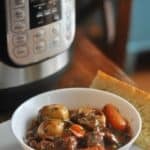 I’m obsessed with my Instant Pot and love its assistance in meal prep for weeknight meals, but if I know I’m going to be home during the day or if I want a nice pot of soup bubbling away on the stove on the weekend, I love putting together a soup on the stove. 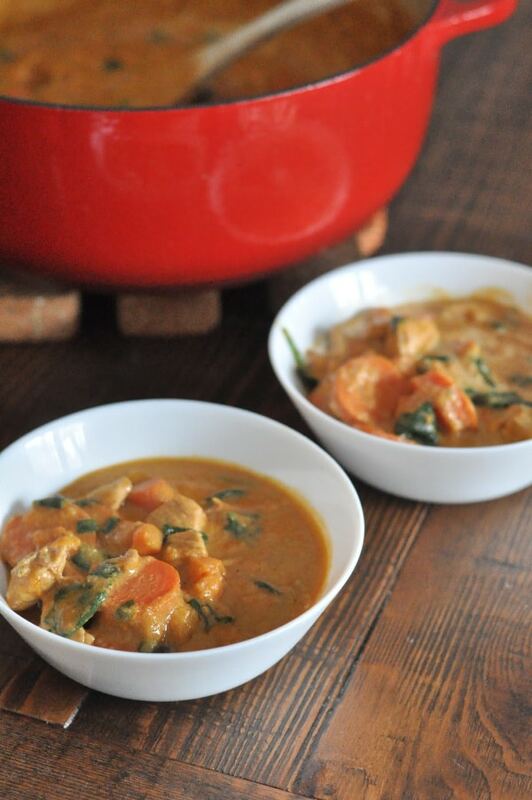 This Sweet Potato and Peanut Soup is perfect for a snow day or a lazy weekend afternoon. 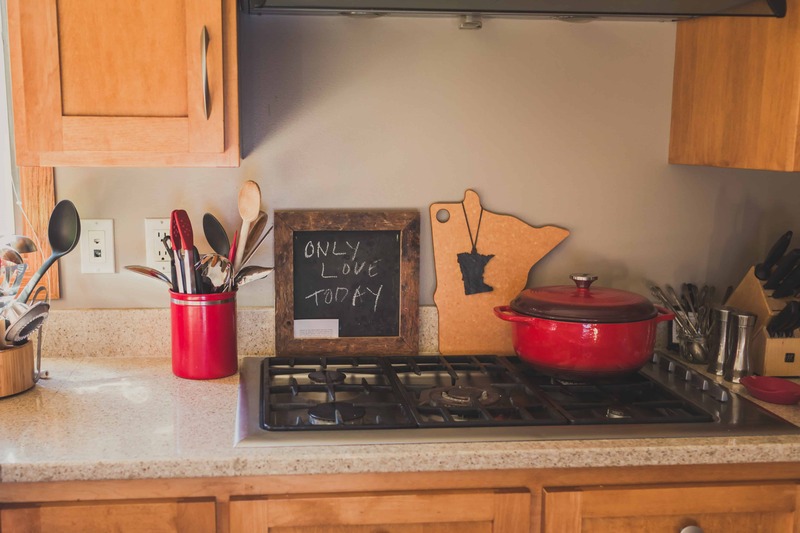 Also, I just learned today that you can minimize temperature loss in your home during severe winter weather by making soups or stews because it introduces humidity and warmer temperatures into your home! What?!? Bonus! 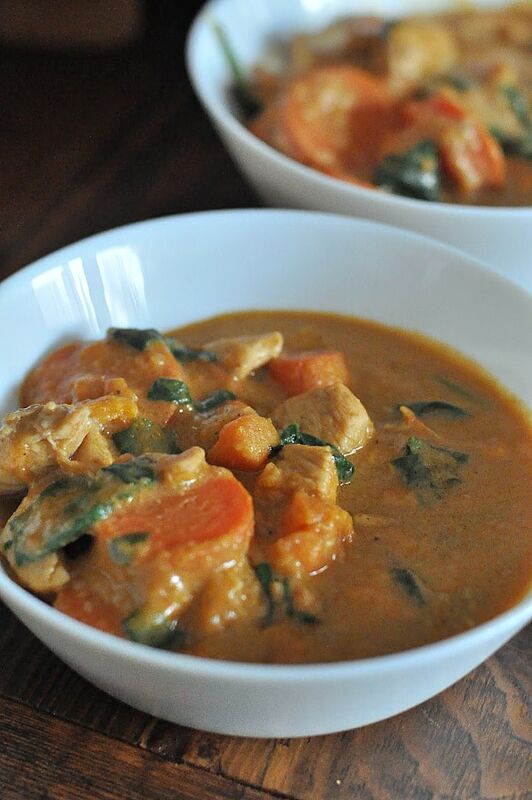 Another reason to make this Sweet Potato and Peanut Soup! 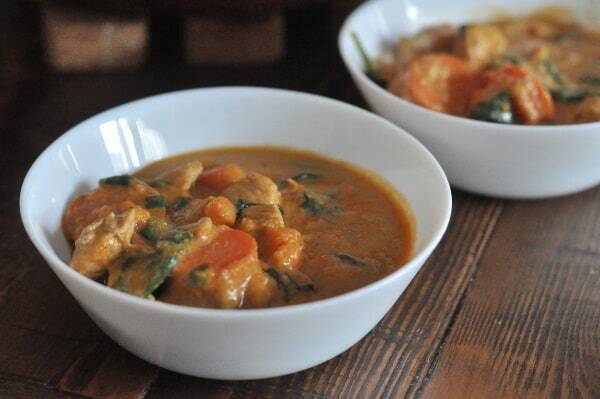 The first step to make this Sweet Potato and Peanut Soup is to melt butter over medium heat and saute chicken with smoked paprika and onion powder for five minutes. 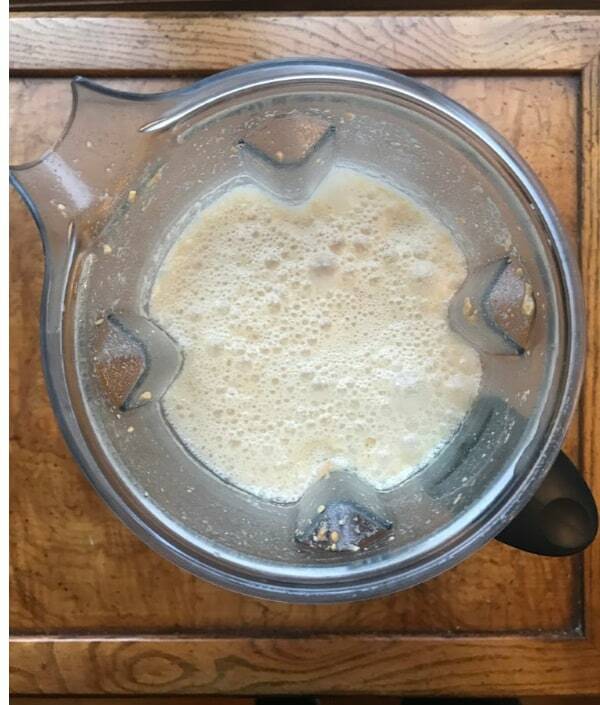 Normally my Vitamix is busy making hummus or Pina Coladas but for this recipe, while the chicken is sauteeing, prepare the peanut broth in a blender. 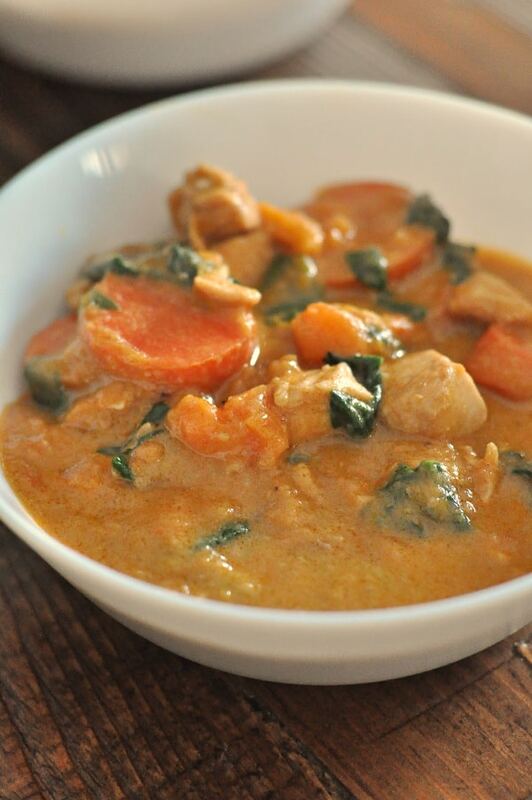 Combine chicken broth, peanut butter, and coconut milk in your Vitamix or favorite blender. Blend until combined. Add the peanut broth to the chicken. Add the cubed sweet potatoes and carrot coins to the soup. Cook for twenty minutes over medium heat. Then add the chopped spinach. Once the Sweet Potato and Peanut Soup is cooked, I drizzle a little bit of heavy cream or half and half on it. For an even heartier meal, serve it on rice! My Lodge Dutch Oven is my essential tool for making winter comfort food like Pizza Soup, Bacon Chicken Alfredo Tater Tot Hotdish, or my Squash Mac and Cheese. It’s been one of my favorite cookware investments, worth every penny! The sweet potatoes in this recipe need to be peeled and I love my Kitchen Aid Peeler highly recommend for all your peeling projects! What’s that weird looking thing holding the peanut butter for this recipe? It’s a Metric Wonder Cup and is my favorite tool for measuring sticky ingredients like mayo, peanut butter, or corn syrup. Sure you can look at the weight on a meat package, but if you by big packs of meat and need to figure out a smaller amount for a recipe (like in this case, 1.5 lbs), I recommend keeping a small kitchen scale handy in your kitchen. I’ve had my Escali scale for about ten years and it’s around $20. I blend up my broth base in my Vitamix. 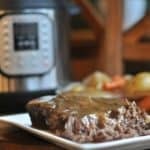 Is it worth it to get a Vitamix? Absolutely. Four words for you: Best.Pina.Coladas.Ever. Because sweet potatoes and carrots come in shapes and sizes, go by the cup measurements in this recipe for the sweet potatoes and carrots. No need to peel the carrots for this recipe, just remove the end and chop into coins! If I’ve made cooked chicken or have leftover rotisserie chicken, I’ve subbed that into the recipe and it works just fine. 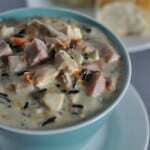 This is a hearty soup but you could make it stretch even further by serving on rice. 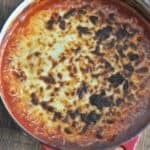 I love using Aldi ingredients and I love that I can get the ingredients all in one place for this recipe. 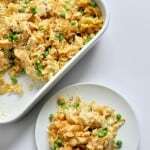 I buy their refrigerated coconut milk for this recipe and use their half and half or heavy cream to drizzle on before serving. You’ll find these dairy items are significantly less expensive at Aldi compared to other grocery stores. This is a freezer-friendly recipe. I put 4 cups (max) in a resealable bag and lay flat on a cookie sheet or cutting board in the freezer. I hope you stay warm during this chilly winter and that this Sweet Potato and Peanut Soup warms up your home and gives you the comfort food that you crave! 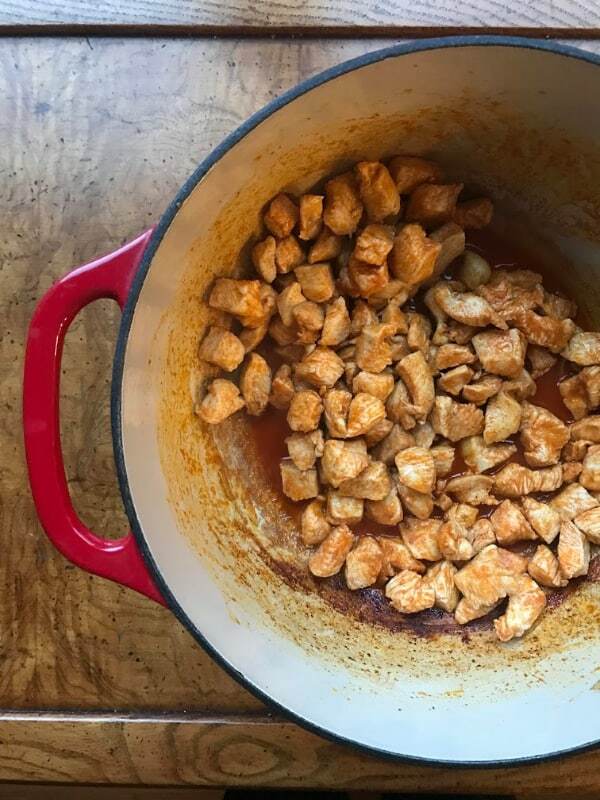 In a Dutch Oven, melt butter over medium heat and saute chicken with smoked paprika and onion powder for five minutes. While the chicken is sauteeing, prepare the peanut broth. In a blender, combine chicken broth, peanut butter, and coconut milk. Blend until combined. Add the peanut broth to the chicken. Add the cubed sweet potatoes and carrot coins to the soup. Cook for twenty minutes over medium heat. Remove from heat and add chopped spinach. Garnish with a splash of heavy cream or half and half. 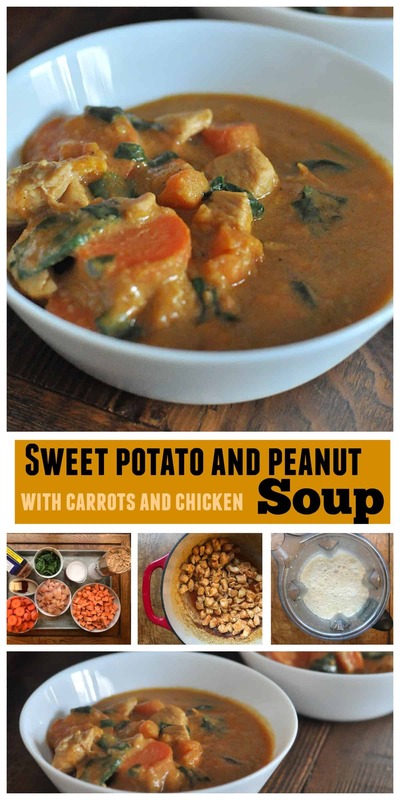 This entry was posted in Soup and tagged carrots, chicken, peanut butter, peanuts, sweet potato, weeknight meal by Alice Seuffert. Bookmark the permalink.